The first barbecue chicken pizza was introduced by the California Pizza Kitchen in 1985. It exploded in popularity in the 1990s with copycats, had a good long run at celebrity, and then quietly slipped off most pizza menus. This isn’t CPK’s recipe, but instead my bacon bastardization of this delicious pizza. 2. Cover a plate with two paper towels, layer on the bacon, and then cover with another paper towel. Microwave for three minutes. Carefully flip the bacon over and microwave for another three minutes or until crispy. Pat off grease and cut into bite sized pieces. 3. Meanwhile brush a 12 inch pizza pan lightly with olive oil and sprinkle with cornmeal. Stretch and roll the dough and place on the pan. Brush lightly with olive oil. 4. Spoon 1/3 cup barbecue sauce around the dough, top with mozzarella and provolone. 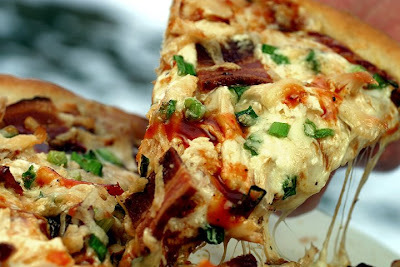 Top with shredded chicken, bacon, scallions, and parmesan. Sprinkle with red pepper flakes, garlic powder, onion powder, salt and pepper. 5. Set on the grill and close the lid. Turn grill to medium high and cook for 5 to 8 minutes or until done. Turn to medium for a thicker crust pizza and cook longer. Remove onto a cookie sheet with tongs. 6. Drizzle with more barbecue sauce and cut into wedges. I became a dutiful foot soldier as soon as I saw the word bacon. This really does look delicious. Ooooooh. BBQ chicken. I love you. Bacon, BBQ, you are calling me!!! It looks so good. Thank you for the comment on my cookies, I just posted the new pics. This pizza is making my head spin! Great job, yum. That is one tasty looking pizza! This look incredibly tasty! I will be bookmarking it to make soon! This looks like it would be a real pizza ad! Good job! That looks insanely good. BBQ pizza is the only kind of pizza I can eat, thanks to a tomato allergy. Can't wait to try this recipe!!! This pizza looks great and I plan on making it. One question, does the bacon go on the pizza uncooked? Thanks for the question. You must cook it first. I put instructions in (Number 2) for fast microwave cooking.